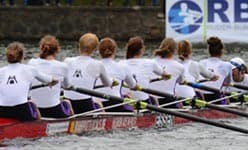 Rowing injuries are often caused by poor technique. It is generally accepted that rowing movements should be as symmetric as possible, with some exceptions during sweep rowing. Different abnormalities in coordination, however, might lead to injuries that are caused by the development of asymmetric muscle tension. Buckeridge et al. (2012) conducted a study to test symmetries and asymmetries in lower limb motion of rowers. Altogether 22 rowers participated in the study. An incremental test was used to assess kinematic measurements of knees, hips, lumbar-pelvic joints, and pelvic twist. Additionally measures of handle force, seat force, stroke length, mediolateral seat drift, and mean external power, were made. In all rowers, lower limb asymmetries were detected, with hip asymmetries significantly greater than knee asymmetries (P < 0.01). Regression analysis indicated that both hip and knee range of motion (ROM) asymmetry was significant (P < 0.05) in predicting lumbar-pelvic flexion at the catch and maximum handle force of the stroke. However, hip ROM asymmetry showed a better relation with lumbar-pelvic flexion compared with knee ROM asymmetry, explaining a greater proportion of the variance. Bilateral asymmetries during the rowing stroke, particularly at the hips, can contribute to suboptimal kinematics of the lumbar-pelvic region. Quantification of hip ROM asymmetries may therefore be a useful tool in predicting rowing injuries, especially for the prevention of low back pain that can be considered as the most frequent injury in rowers. Buckeridge E, Hislop S, Bull A, McGregor A. Kinematic asymmetries of the lower limbs during ergometer rowing. Medicine & Science in Sports & Exercise 2012; 44(11): 2147-53.